I have my first EM, Doodle Bug, and the original cord has been cut off. I want to replace it with a modern cord with a ground. Picture is attached, with the original brown power cord running to a brown wire on the left and a yellow wire on the right. To the left of all this is a green wire marked "ground wire." I can desolder the old cord and solder the new cord onto the lugs for the brown and yellow wires easily, but I don't understand electricity well enough to know which of the brown and yellow wires is the power and which is the neutral. Also, I assume that I can just solder the ground from the new cord onto the lug for the green wire. Can someone please tell me if it's a safe option to solder on all three wires from a new cord, and, if so, which cord wire goes to brown and which to yellow? I'm hoping that a Doodle Bug owner will know, or that someone can explain to me how to test the wires for power and neutral (I have a meter, but I'm a novice at using it), or that it doesn't matter which wires go to which, as long as the ground goes to green (a dangerous assumption?). I'd be very grateful for the help. "...For better safety, it's not a bad idea to replace the game's original two prong power cord with a grounded three prong cord. Again, the same technique can be used - buy an inexpensive three prong 15 foot extension cord at the Dollar store and cut off the receptacle end. Also again the new power cord should have a "ribbed" insulator wire which connects to the larger of the two power prongs. This is the "neutral" (white) wire. The "hot" (black or smooth wire or narrow prong) should connect to the line going to the power switch. The green ground wire should connect to the transformer's metal frame bolt. Optionally, additional grounds can then be run from the transformer's metal frame to other metal objects (like the lockdown bar and metal side rails and metal leg plates)." Thanks for the reply. That helps a bit. I live in Switzerland, Europe - we have 220 Volt AC - I do not write about US- wire color / ribbed or non ribbed - whatsoever. Fact is: The pin runs "this way hooked-on" as well as "other way hooked on". Fact-Two: Hooked-on "wrong" is VERY dangerous. Learn about "Juice / POWER side of House Outlet" --- POWER-Side MUST be connected to "Wire-Yellow to the 10 Amp Fuse". House-Outlet-NEUTRAL MUST be connected to "Wire-Black-to-transformer". Make You a paper tag - a cover to cover the fuses completely (!!!) and on this paper tag have the text: EXTREME DANGER - AT THE TIME THE LINE-CORD IS PLUGGED-IN: 110-VAC-FUSE HAS 110VAC POWER !!! 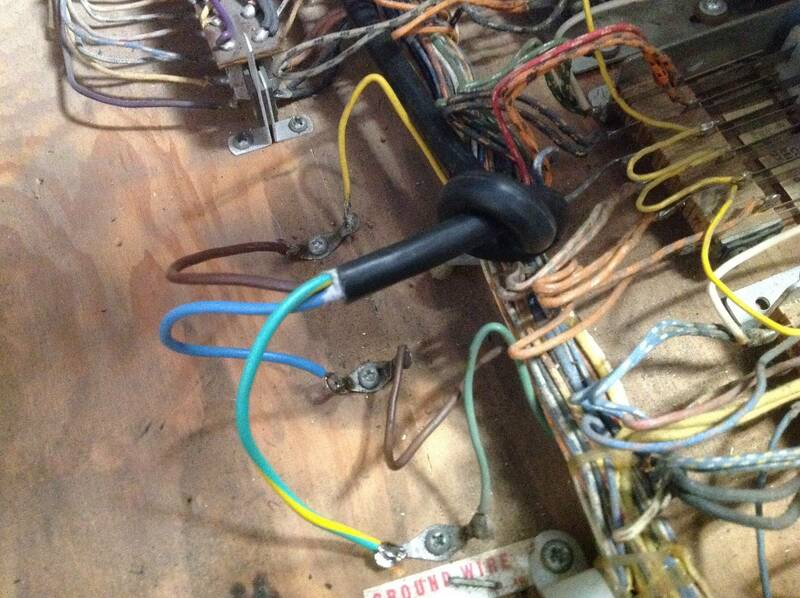 ALWAYS UNPLUG THE LINE-CORD WHEN WORKING ON THE PIN !!! To clarify why you must wire it this way, you want the hot side flowing only up to the power toggle switch and no where else when the machine is switched off. Thanks OP for a great question. Just don't solder the wires together if you are using wire nuts. Have fun with your Doodle Bug! Thanks so much for these replies. They are helping me piece things together. More advice is appreciated if anyone has any. I agree with Herr Rolf, based on the references posted by Fredsmythson and dr_nybble. You want the hot line from the power cord to connect to the fused line that runs to the power switch. In the snippet of the Doodle Bug schematic that Rolf has posted, this is denoted as a yellow wire. PLEASE VERIFY THAT THE YELLOW WIRE INDEED GOES TO THE LINE FUSE!. If it does, then the hot wire connects to the yellow wire. The power cord hot wire will be the line that comes from the small-prong opening of the receptacle. In the US, the small prong opening is always on the right side of the outlet. With the power cord not plugged in, you can verify this with a multi-meter set for continuity check or for resistance check. What is confusing, is that Rolf's schematic shows the neutral wire as being black, where your machine seems to have a brown wire emerging from the wiring bundle??? Not sure what to make of that difference. OK, Please ignore my advice from the previous post. The pin repair guides indeed say: The "hot" (black or smooth wire or narrow prong) should connect to the line going to the power switch. According to the schematic snippet, that would be the yellow wire. However, I have a Williams EM where the left-side prong is connected to the yellow wire. Until I figure out which should be which, ignore my post. And yes, use your meter to check which wire goes where. in Europe we have 220VAC - we have a nice Screwdriver-Test-Lamp (see upper right corner of the JPG). We put the tip of the screwdriver into one socket of the house-wall-outlet - then we put the thumb onto the end of the screwdriver --- IF (if, if) the little lamp in the screwdriver lights up (dim light) - we are allowed to say: THIS is the HOT side (((if the lamp does not light up we are not allowed to say: This is not HOT, professional electricians very much dislike these screwdrivers))). A thing not related with the topic / problem "replacing a 110VAC cord on this Doodle Bug" --- I want to show "DANGER - Gottlieb pins are wired different than Williams / Bally pins". Whenever I work on a pin: I toggle-off and unplug the main power cord - so I am save. I ONLY plug-in / toggle-on when I do a test needing electricity. Williams / Bally and Gottlieb have the same situation on the 110VAC-side of the transformer: House-Outlet-HOT comes to fuse comes to toggle-switch comes to transformer-HOT-side. Williams and Bally run the HOT side to fuse to coils (my red lines). 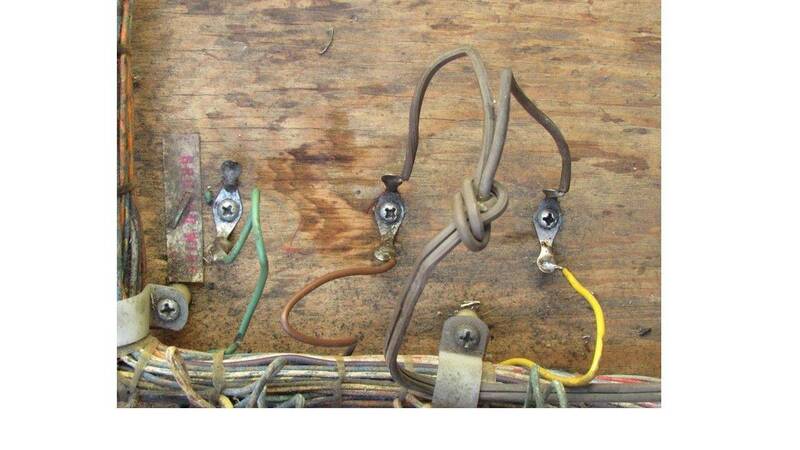 Williams and Bally have the switches in the "wiring back to transformer-24/48VAC-Neutral." 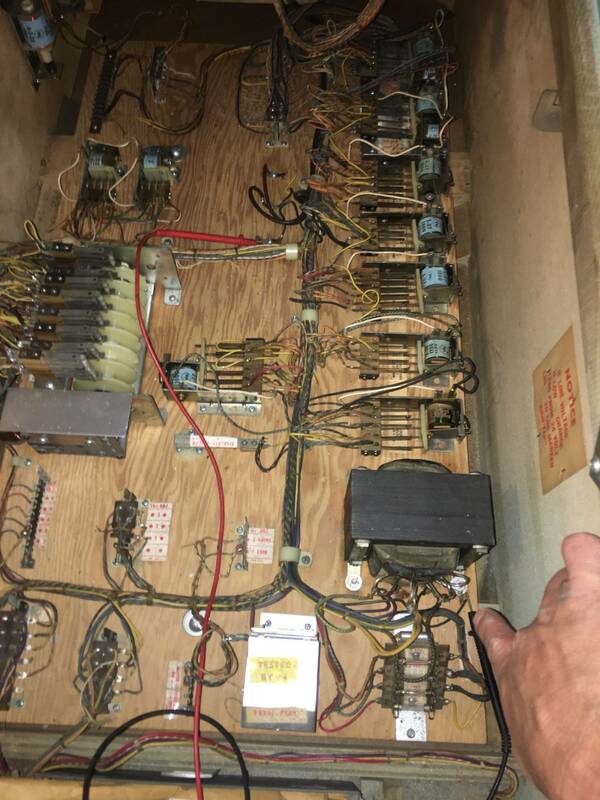 Gottlieb runs HOT side to fuse to switches (many switches many wires) - then to coils. Gottlieb then has a direct connection to "back to transformer-24VAC-Neutral". The yellow wire from the schematic indeed goes the 10 amp fuse (then to red, then purple, then the transformer), so that's easy to verify as the power. However, the brown and yellow wires in my Doodle Bug (as pictured at the top of the post) are far from the transformer--they're halfway back in the cabinet--so I still have to figure out which is hot and which is neutral between them. Maybe I can physically trace them to the transformer and figure it that way, but I'm still not sure. Just going to throw this out there. Many plugs from the seventys had no wider blades to make sure hot was where it was supposed to be. The cord I just replaced on a 1970 Gottlieb was like this. I have another the same way. With plugs like these, some people call them "lamp cords" it wouldnt matter how you wired the pin as you are rolling the dice every time you plug it in, as plug can go either way. Obviously the transformer doesnt care? Works either way? Not suggesting this is true for all pins. A little trick I have begun to use, buy a 15-25' 3 prong extension cord. lay the socket end down in the rear of the cabinet, bring the wire up to the front where the on/off switch is normally located, and cut the cord in two. Wire the switch in line with the black wire, and wire nut the white back together. You need another 3 prong cord, just the plug with about 2 feet of cord. Wire the short cord with the plug into the power wires on the bottom board, and the plug will hang off the back. plug in to use, unplug to service, and remove bottom board, without havin to mess with the cord. the green wire at the switch, can be added to for a front door ground, lock bar, and flip switches if needed. One reason that it's critical to have correct polarity in this particular game is that a bridge rectifier is utilized to convert AC to DC in order to provide sufficient oomph to start the doodle bug feature. Incorrect switching of hot/com will destroy said bridge rectifier. The protective fuse will immediately blow and the feature will be rendered inoperative. So thanks to all of you for this detailed advice, and I'll close out this thread now with an update. Reading the above cautions and consulting with some other pinball friends makes me realize that it won't be wise for me to put in a new power cord on my own. A friend from out of town with EM and electronics experience has agreed to visit sometime and help me get this job done properly. That way we can test the transformer as well, and we can wire the hot side directly to the power switch and ground the cord to the mounting plate. So I'll wait for him to help me, and plan to update this thread with the results. There is no rectifier in this game. The magnet runs off 110v directly. Yellow = fused = switched = hot = little spade = smooth on a two prong - the type of plug that has been in there since 1971 without incident. I would suggest you just replace like with like. If you want to make it with a ground, just figure out which is hot on that plug and wire it to the yellow. If the spades are all the same size, you can just see which one goes in the small hole on the wall outlet. If you go this route, be sure to go back and read the 18k + posts on how to properly ground an EM. I think there are something like 17999 opinions. 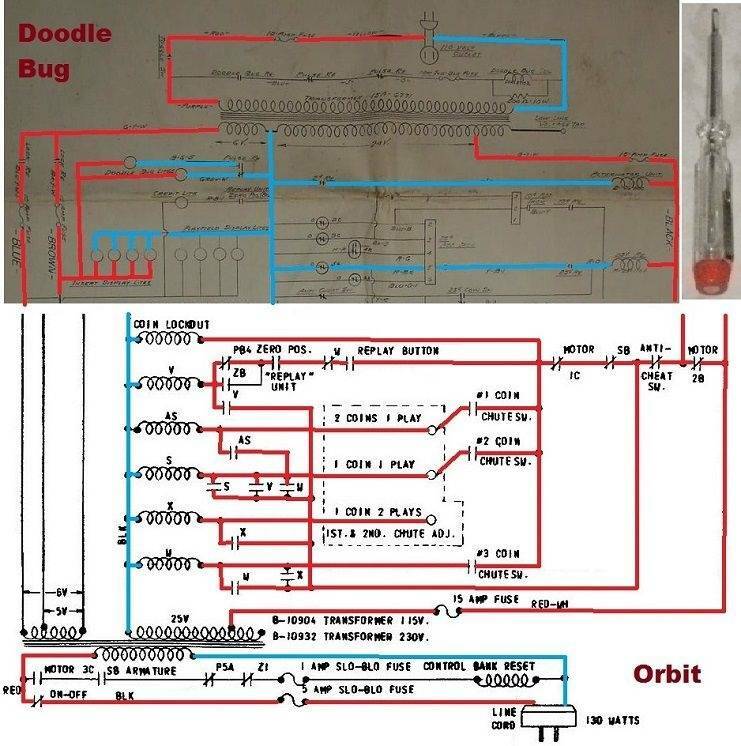 I response to your question on the ground, the green wire in your first picture is NOT on the schematic. Indeed, as you point out, it isn't attached to an earth ground at all. In my game, this green "ground" wire only goes to the transformer case - see picture below. As such, it really doesn't do much. If you want to hook up a three prong plug and attach it to the green wire, it would be fine. It also won't really ground much of your game. Later EMs with legitimate ground wires would run it to the transformer, the door and the on/off switch metal housing. This would actually ground the lockdown bar and side rails, as they were all connected to the door via the lockdown mechanism. Those are the facts. Opinions vary wildly on this topic. I could start a gofundme for a flooded basement and get less down votes than suggesting you leave your machine as it was manufactured. Thanks so much for the detailed reply. I did just hook up a new three-pronged plug to the wiring in the first picture: hot to yellow, neutral to brown, and green to ground. Switched on the game and got a light buzzing, but that's it--no GI and no motors running. No fuses blown either. So back to the drawing board, but at least I have power. I'll read up more on grounding as well. My machine also has a marked ground wire at the transformer. My machine also has a marked ground wire at the transformer. I think that is what I am pointing to with my right hand. The issue is that this is the only place the "ground" wire is. I see no value to it. Joe, I did not realize you were having such issues with the doodle bug. I would have stopped by to take a look at it. No GI is not a good sign if the fuses are good. Have you put your multI meter on the various inputs and outputs of the transformer to verify power is going in and something close to the right volts are coming out? Thanks, mg81. Up to this point I've been disassembling, cleaning, replacing broken parts, and reassembling. Now that I have the power cord in I'm ready to start troubleshooting, and I'm absolutely lousy with a meter--my knowledge stops at fuse testing. Yes, please do come by when you have time and educate me. I replaced the destroyed lock relay, so the lock relay switch stack could be worth a look as well. Post your schematic here or better yet at IPDB to get our best help. Please post your results (with closeup pics?). I also have a Doodle Bug that needs a replacement cord. I have the same wire colors as joeschall. I connected yellow/green to green (ground), which goes to the transformer, blue to brown (neutral), which also goes to the transformer, and then brown to yellow (hot), which goes to the fuse holder. The game has GI and works, but there is a loud buzzing that I don't remember hearing before. Using the wooden chopstick trick, I found that the buzzing is coming from the lock relay. Is it possible that the game now has plenty of juice and the crispy lock relay is just struggling to stay on? I think I'll search for "buzzing relays" next.